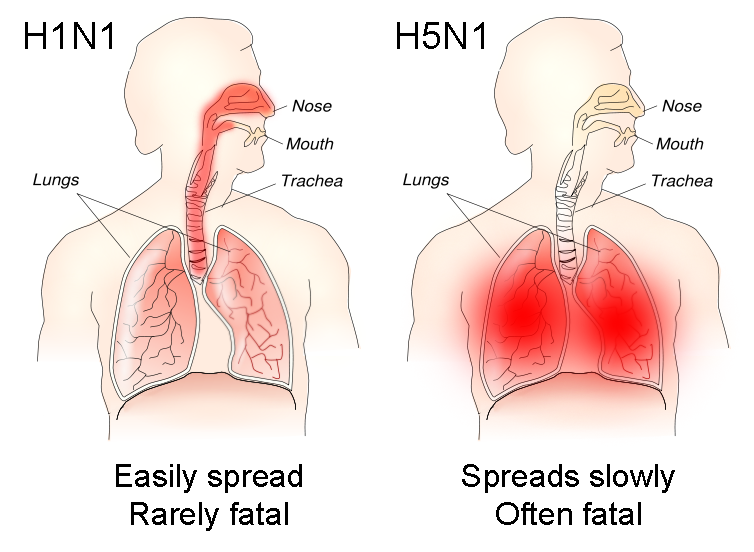 which are caused by viruses, transmitted by droplet way, characterized by intoxication and catarrhal syndrome with predominant changes in mucous membranes of the upper respiratory tract. • Parainfluenza, 5 types of human parainfluenza virus that belong to paramyxovirus family (large RNA viruses 150-200 nm, contain hemagglutinine and neuraminidase with stable antigen structure). • Respiratory syncitial (RS) virus, belong to paramyxovirus family (large polymorph RNA viruses 120-200 nm) doesn’t have neuraminidase and without hemagglutination ability, grew only on the tissues cultures. • Rhinoviruses, with over 100 serotypes, belong to picornavirus family (small RNA viruses 20-30 nm, instable in the environment). antigens, could agglutinate the blood. o droplet with inhalation of small or large airborne drops during coughing, sneezing, speaking, by contact with contaminated hands, toys ets. · Complaints: more or less severe symptoms of general intoxication, catarrhal symptoms are sore throat (considerably rarer is pharyngeal pain), cold, dry cough. · Moderate hyperemia, mainly palatal arch, soft palate, uvula, back pharyngeal wall with the presence of grittiness (lymphoidc follicles are enlarged). · Hyperemia of nasal mucosa. · Tonsils are mainly intact (except adenoviral infection). · Conjunctivitis (more or less severe, in dependence on the type of URTI). · Signs of a few parts of upper respiratory tract inflammation. · For every type of infection the prominent inflammation of one part of upper respiratory tract is characteristic with development of typical clinical signs. · Sporadic morbidity, grows in winter. · Latent period is 2-7 days. · Toxic syndrome is mild or moderate. · Catarrhal phenomena are not severe. · A basic clinical sign is a catarrh of upper respiratory tract. · Peculiarities in infants and under-fives: a croup syndrome is often the first display. · Sporadic morbidity and epidemic flashes. · Winter seasonality, possible flashes in summer. · Latent period is 2-12 days. · Toxic syndrome is moderate. · Conjunctivitis (photo 89, 90). · Lymphoprolipherative syndrome (acute viral tonsillitis, neck lymph nodes enlargement, hepatomegaly (rare splenomegaly). · Latent period is 3-7 days. · Winter seasonality, acute beginning. · The children of senior age have mild forms (as an acute bronchitis). · Croup is less common. · Epidemic flashes (in winter, in autumn). · Latent period is 1-5 days. · Often bacterial complications (later – purulent effusion from the nose). · Bacterial complications (otitis, pneumonia, etc.) and mortality appear more often. · Identification of virus from nasopharyngeal smears (also feces or blood in Adenovirus infection ) by culture, immunofluorescence, or ELISA. · In CBC, mainly leucopenia (normocytosis) with a shift to the left and relative lymphomonocytosis. Etiological diagnosis may be put in case of the virus identification, in other case diagnosis will be URT viral infection + leading clinical syndrome (for example: URT viral infection: rhinopharyngitis, or URT viral infection: obstructive bronchitis, Respiratory insufficiency 2nd degree; with intestinal syndrome. Differential diagnosis should be performed between other viral respiratory tract infections, allergic rhinitis, foreign body aspiration, epiglottitis, bacterial tracheitis, pertussis, measles, Epstein-Bar Virus infection, bacterial croup. · Rhinoviral infection: with allergic rhinitis, foreign body of the nose. · RS-infection: whooping cough, chlamidiosis, mycoplasmosis. · Adenoviral infection: with infectious mononucleosis, micoplasmosis, and measles. · Parainfluenza: with true croup in diphtheria, other viral croup (i.e. in measles). Stenotic laryngotracheitis, or false croup, exists in case of ARVI (influenza, parainfluenza, аdenoviral infection), measles, Chickenpox. Diphtheria of the respiratory ways has clinic of true croup, which necessary to differentiate with false croup. Typical triad, but Stridor appears only when child is irritable, during physical exercises. Laboratory signs of breath failure are absent (lips are pink, blood gases are normal), metabolic acidosis may be present. 4. Control of fever and myalgia (when the temperature is more than 38.5-39˚C); in children before 2 mo and in case of perinatal CNS damage, seizures in the history, severe heart diseases – when the temperature is up to 38˚C with acetaminophen (paracetamol 10-15 mg/kg not often than every 4 hours (not more than 5 times per day) oribuprophen 10 mg/kg per dose, not often than every 6 hours. Aspirin is contraindicated for children before 12 years. · Adenovirus conjunctivitis treatment – antiviral eye drops: poludanum, interferon, 0.05% deoxyribonuclease or 0.5% tebrophen ointment; corticosteroids as Dexamethazonum for 4-5 days. • Cephalosporines of 3rd-4th generation also are used. • At presence of the methycillin resistant staphylococcus – vancomycin, in case of nosocomeal pneumonia carbapenems are appointed. Management of croup depends on the severity of disease. · Air in an apartment must be moistened. An emotional and physical comfort is provided for a child. · Local therapy is directed on the improvement of venous outflow and normalization of lymph outflow: warming of interscapular area, shin muscles, heels. · A dry heat should be placed on a neck. · Warm dosed alkalic drink. · Inhalations by antioedematous mixture, steam inhalations. · From medicinal therapy: vitamin C and P, and antihistaminic medicine in age-old doses. · Hospitalization only in the case of presence of problems in a transport connection between a hospital and child’s placement. At the 2nd degree of stenosis a child must be transported into the hospital, where is possibly of artificial pulmonary ventilation. Treatment of child must begin on the prehospital stage with continuation in the hospital. · Inhalation of water-wet and warmed oxygen. · Sedative medicine with the purpose of diminishing the inspiratory efforts. · Glucocorticoids 10 mg/kg per day by prednisolon. A dose is distributed on 4-6 receptions without the observance of biological rhythm. · Antihistaminic preparations in age-old doses (dimedrolum). · Careful treatment of bronchial obstructive syndrome: broncholytics, mucosolvents. At a considerable obstruction tracheobronchial tree lavage is done during a few hours. · A decrease of child’s body weight on 3-4% (stimulation of urination with reduction of daily liquid receipts to 80% of physiological amount). · Sanation of tracheobronchial tree and feeding the child before next introduction of Sedative medicines. · Under the heart rate control it is possible to use adrenalin inhalations (1:20, 1:15) that enables the edema of subvocal space decrease quickly, but not for a long time. At the 4th degree of stenosis a pneumo-cardial reanimation, treatment of cerebrum edema-swelling is performed. 1. Intranasal alpha2-interferon was active only against rhinoviruses and prevented a cold in only 40% of cases. It must be given not longer than 1-2 weeks. 2. Arbidol to the children elder than 12 yrs. — 0,2 gs; children of 6-12 yrs. — for 0,1 gs, children of 2-6 yrs. — 0,05 gs 1 t.d. for 10-15 days, or Thiloron to the children elder than 7 yrs. through a mouth: 60 mg once a week during 6 wks. · The moist cleaning up of apartments is needed not less than two times a day.